Rugged cliffs, bright pink beaches, and one-of- a-kind flora and fauna — plan your holidays in Komodo and you’ll get to see it all. This exotic Indonesian getaway is home to the Komodo Dragon, a large, dinosaur-like lizard that attracts thousands of wildlife enthusiasts to the archipelago. If you want your Indonesia travels to be filled with all kinds of exciting outdoor activities, then a trip to Komodo is not to be missed. Komodo National Park is the main attraction of the area, as it’s home to over 2,500 Komodo Dragons, a rare kind of lizard. In it, you will also get a chance to explore wild savannahs, thick rain forests and mangroves. 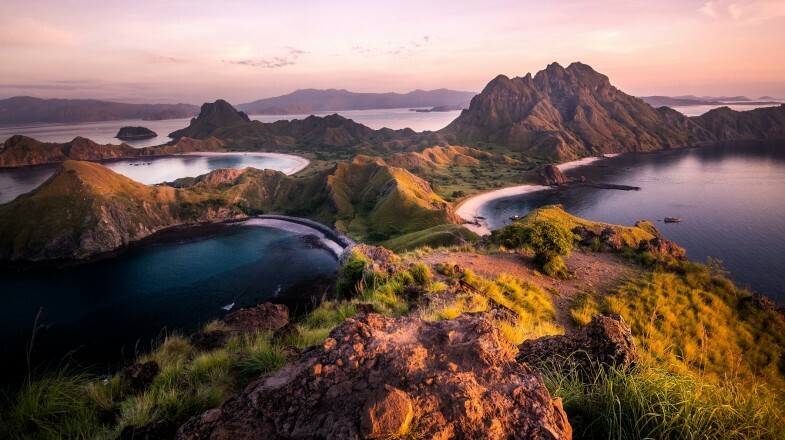 Padar Island, one of the islets that comprise Komodo National Park, is the go-to spot for trekking. The hike might be a little demanding, but once you reach the top, you will be rewarded with some of the most spectacular views of the archipelago. Pink Beach is a mesmerizing sandy getaway, whose unusual color comes from a microscopic species that reflects red or pink light on the reef. Manta Point is one of the most exquisite spots for snorkeling, where you will be able to catch a glimpse of manta rays, gorgeous corals and other aquamarine life. If you’re lucky, maybe you spot a turtle or two! This region is serviced by Komodo Airport (Bandar Udara Komodo in Indonesian), which is located near the town of Labuan Bajo. It offers regular flights from both Bali and Jakarta. The most convenient place to stay when exploring the archipelago is the town of Labuan Bajo, which offers a wide range of lodgings for all budgets. It is without a doubt that your visit to Komodo will involve hiking at some point, so make sure to arm yourself with appropriate clothes and footwear, as well as heavy-duty sunscreen.